El Mercadito, located on the first level on the right-hand side of Plaza Adelante, serves as an incubator for microbusinesses started by MEDA clients. 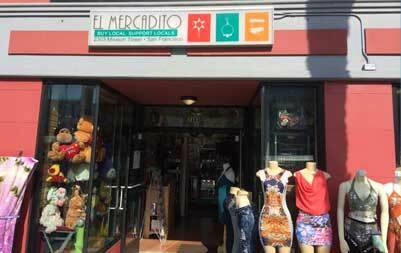 There are currently six small businesses in the Mission District El Mercadito, plus Cholo Soy, a cozy Peruvian food shop in Plaza Adelante’s paseo. There is even a new Tenderloin El Mercadito, which currently features a café. All business owners went through MEDA’s free Business Development Program and later received one-on-one coaching. Back in Peru, my mother was always running her own businesses, which varied by how the market was going. Sometimes she would sell vegetables. Other times she would bring various items down from the Highlands and sell them in bulk. Of my four siblings, I was the one who helped my mother the most in her businesses. On my father’s side of the family, he ran a restaurant similar to Cholo Soy. He served the traditional dishes of Peru, which I have brought here. My aunt, who was my father’s sister-in-law, made great ceviche. Actually, all things fish. I learned that part of the business from her. So, it was an all-around family learning experience for me that has produced Cholo Soy. Why did you name your restaurant Cholo Soy? “Cholo” is a term for someone from the Highlands of Peru who comes to the coast. When my family came to the coastal city of Chimbote, we were referred to as “cholo.” My restaurant’s name means, “I am Cholo.” I am proud of where I came from. What is your bestseller at Cholo Soy? The ceviche is my top seller. I serve about 50 clients each day, Monday to Saturday. 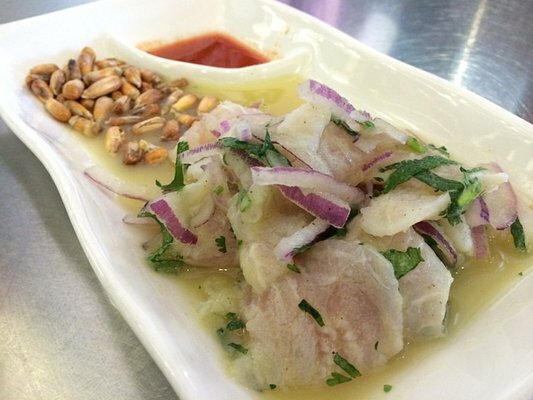 The ceviche is why most come here, although my favorite dish is seco de cordero. That’s a lamb dish in a cilantro sauce. I have a secret ingredient that makes it special, but I can’t tell you what it is (laughs). Why did Cha Cha Cha ask you to serve dishes this Sunday night? Cha Cha Cha’s Mission location is just a few doors down from El Mercadito at Plaza Adelante. I didn’t know it, but the head chef was regularly coming by and trying my different dishes. He then brought the marketing person with him and he enjoyed my food, too. So, they decided to invite me to have a “Peruvian Specials” menu this Sunday. I’ll be serving two appetizers and three entrees. This is very exciting for me—a great opportunity! What did you learn at MEDA programs? Through MEDA’s Free Tax Preparation program, I got an Individual Taxpayer Identification Number (ITIN). MEDA also helped me get a credit score. I had a score of zero. So, the Financial Capability team got me a Secured Credit Card. After a year, my credit score was good enough to get a regular credit card. I later learned how to get a license and permit from the Business Development program. Language is the biggest issue, as my English is not as good as I want it to be after nine years in the States. Lack of funding is also a problem. I am working with Business Development Coach Sabrina Haman to see how I can get the money I need to expand. My initial funding came from money I saved–bit by bit, week after week—while working at a restaurant called Daily Grill near Union Square in downtown San Francisco. All that money was saved to eventually buy the equipment you see today at Cholo Soy. My goal is to take my current restaurant out of El Mercadito. 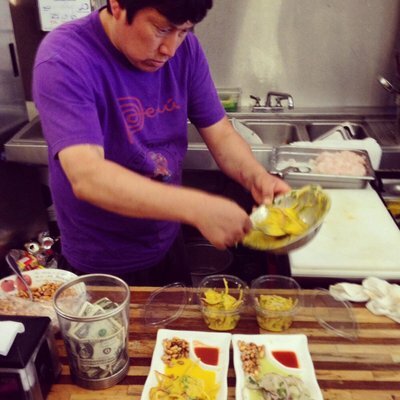 I am so happy MEDA gave me the chance to start my restaurant here, but it is time for me to find a larger Mission District location. I want to have more employees. Currently it ‘s just me and my wife, Belvis Aguilera, plus two employees. In a few years, my dream is to have opened three more restaurants: one in Seattle; one in Boston; and one in Fremont or Sacramento. Then I want to open one more restaurant every year after that!